After banning visitors from walking on Shan State’s famous Goteik Viaduct, security tightens as people continue to visit during the rainy season. 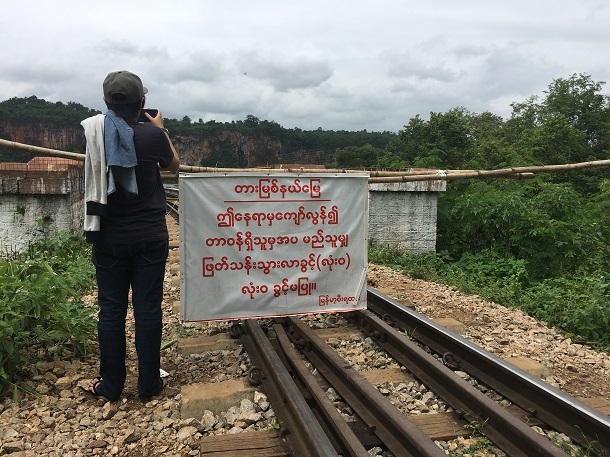 NAWNGHKIO TOWNSHIP, Shan State—After banning visitors from walking on Shan State’s famous Goteik Viaduct as a safety measure, security has tightened while people continue to visit during the rainy season. Located in Nawnghkio Township in northern Shan State—on a stretch of the Mandalay-Lashio railway between Pyin Oo Lwin and Kyaukme—the popular tourist site is the highest bridge in Burma and was once the largest railway trestle in the world. Construction began during the British colonial era in 1899 and the steel towers and 2,260 feet of track was completed in 1900 by Pennsylvania and Maryland Bridge Construction, an American company. Tourism has grown in the area in recent years. 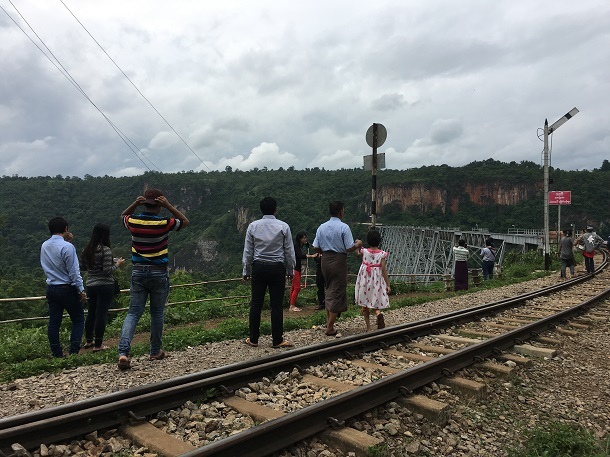 “Even during rainy season, more than 500 people come on the weekends to see the bridge, so we’ve restricted crossing,” said Yin Htwe, an official from Myanmar Railways. He said the restriction was put in place in February, because many people walked on the viaduct in order to take “selfies” on it. “The bridge is so high—more than 300 feet from bottom to top—and there were times when people have nearly fallen off. We are limiting them for their safety,” Yin Htwe added. “Some people want to sneak past the ‘restricted’ signpost. That’s why security personnel have to watch visitors all the time,” he said. Yin Htwe said that many foreign tourists now take the Mandalay-Lashio railway, which runs twice a day and takes 20 minutes to traverse the Goteik viaduct, the indisupted highlight of the route. “We took a one hour drive on a bumpy road from Nawnghkio to Goteik. It’s tiring but worth it to enjoy a new experience,” he added. Prior to February, the Burmese government had allowed people to walk on the bridge, but fearing for the safety of visistors they issued the ban.